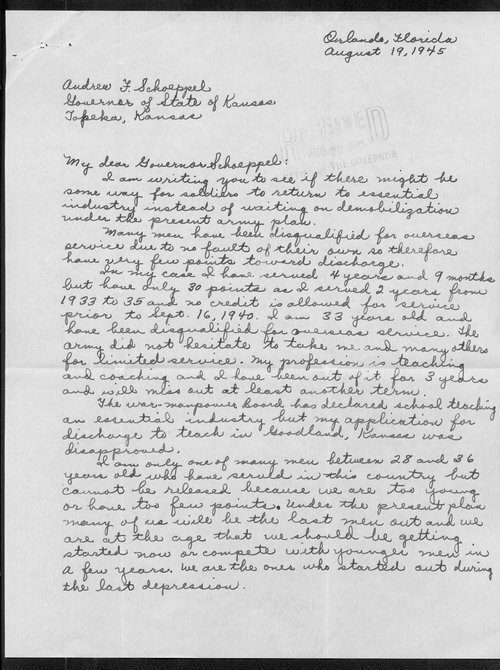 In this letter to Governor Schoeppel, PfC Garnold Scheider asks Schoeppel to help facilitate his return to civilian life. Arguing that his experience as a teacher is needed in Goodland, Kansas, Schneider ponders why the school systems in the U.S. have not "banded together and requested the release of men as the railroad and mining industries have?" This item can be used alongside other materials on the home front durign World War II to give students an idea of the type of obstacles faced by servicemen as they attempted to get out of the military and return to civilian life.